roping to fit your front door. Grab a wagon and fill it with bunches of our freshly cut bunched greens- we have so many kinds to choose from this year. Bring in the dimensions of your ceramic or concrete urns and we can customize a pot of greenery to “drop in”. Voila- instant decor! Our tree twirling team- Natureworks men with trees! 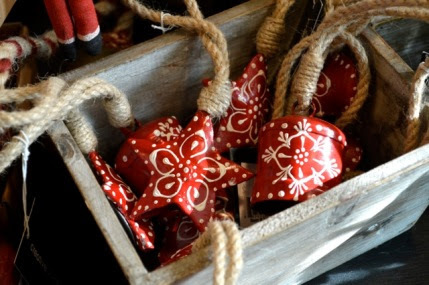 Step inside the shop and enjoy a glass of wine, nibble on cheese and crackers and more cookies while you shop for ornaments, forcing bulbs, and gifts for the gardeners and nature lovers on your list. New this year, we are featuring Mantelscaping. 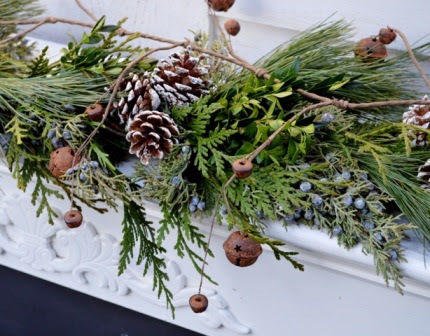 Let us help you pick out the greens, berries, candles, containers, plants, cones, and ornaments to make your mantel (or sideboard) simply beautiful. 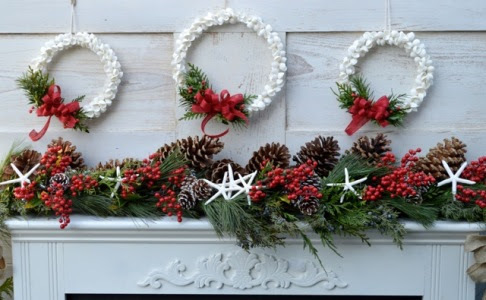 This idea was inspired by my friend and neighbor Pam Hartz Miller who wrote the book A Mantel for All Seasons. She gave us her mantel to use in our photographs this year. budget and when you need it. 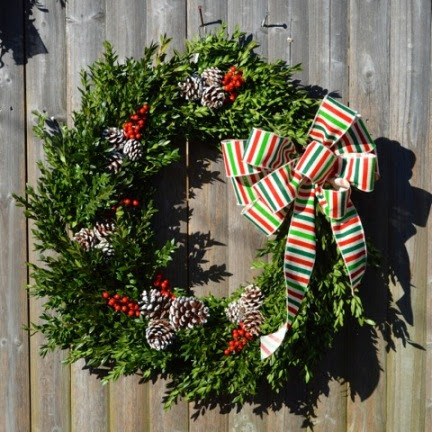 We will create a wreath, swag, or arrangement just for you. Tons of folks do this and we welcome them back year after year. We make birdbath toppers, mantel roping, fill urns and hanging baskets, create custom cemetery pillows for loved ones- you name it, we will make it for you if we can! You can choose the ribbon and berries or just simply give us a picture of something you love and we will recreate that style or feeling. 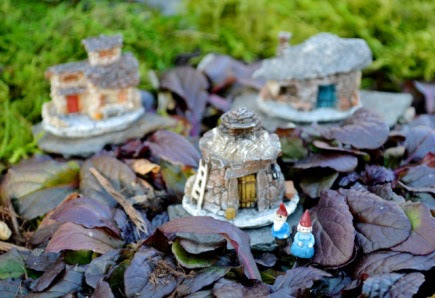 Can you spot the tiny gnomes tromping through the Ajuga to get home? 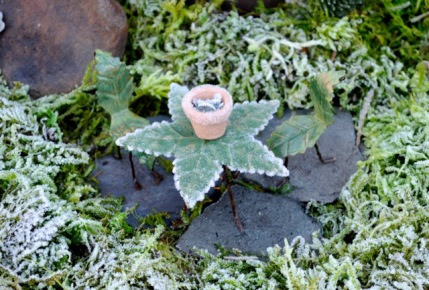 This is the teeny tiniest clay pot ever, set on a teeny tiny leaf table in a bed of moss. Small is enchanting. sits outside of our greenhouse. If you have a balcony or a front stoop or a porch, you can plant a miniature evergreen garden. 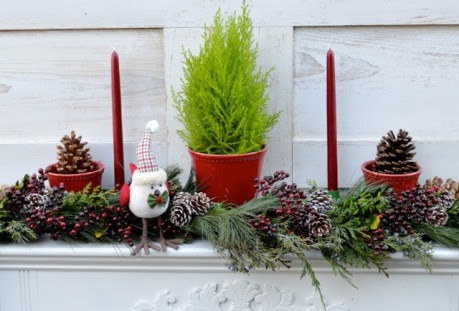 Place a lemon cypress in a shiny red pot on your dining room table and suddenly you will be feeling festive. Set some burgundy red candles on your windowsill and light them when you have friends over. Lay cones at their base, and maybe a small vase of fragrant fresh greens with a sprig of winterberry. 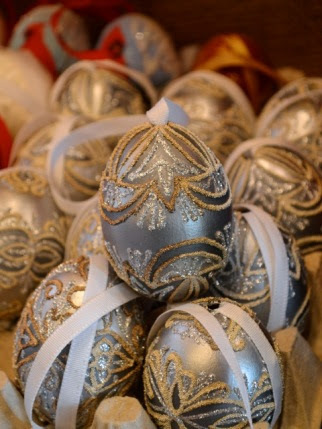 These are REAL eggs, handpainted in small villages in Austria. Over Thanksgiving weekend, I visited relatives with young adults just starting out with their own apartment and their very first tree. Ornaments are the perfect gift for them! 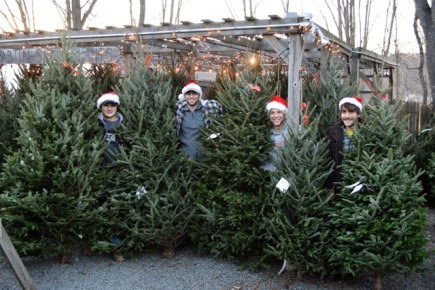 If you had holiday decorating traditions in your home, you can bet that when your children settle down, they will too. 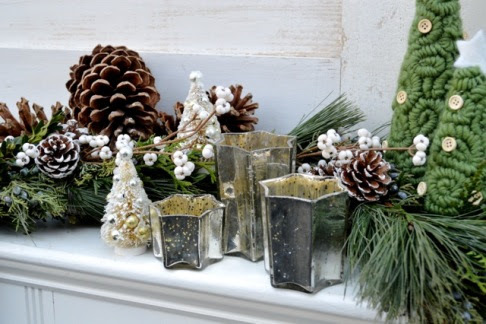 Houseplants and pretty containers also make great gifts. I like to give an amaryllis bulb planted in a pot to folks who don’t get out much during the winter months. My parents used to call me on cold winter evenings, yardstick in hand, to tell me how many inches their amaryllis had grown. When it bloomed, I got Instamatic pictures sent in the mail! Can you guess the most popular phrase that just about everybody utters the minute they step foot in Natureworks at this time of year? place when this time of year was a bit simpler, less plastic, more natural. That’s what we focus on here at Natureworks. We offer you a place to escape, a respite from the crazy commercialism that bombards us. It smells good and it feels right. Exhale. Breathe in. Smile. Eat a cookie. Sip some cider. Enjoy the moment. See, isn’t it fun? 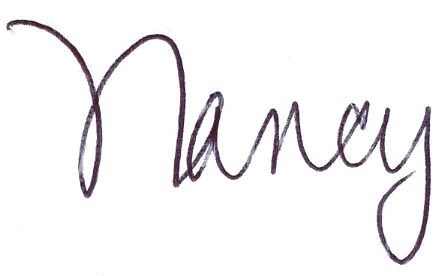 This entry was posted in Blog, Classes, Events, For App. Bookmark the permalink.